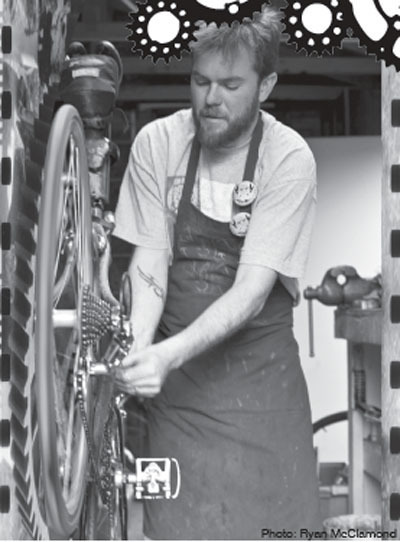 Johnny Barlow owns Salt Lake City's most exciting up-and-coming bicycle shop. The location is prime and his hours are typical for someone who'd rather have Mondays cease to exist. Operating as "The Bike Guy," on 1555 South 900 East, Johnny Barlow runs his shop out of his home's garage and backyard. You won't find any cars in that garage of his, just tune-up tools, bike lube and all of the other makings of a fully loaded bicycle shop. Barlow works five days a week alongside his family and apprentice, building bikes and repairing others. His front lawn is often lined with fun-looking vintage bicycles and a sign reading: "15 Dollar Tune-up." On Saturdays, there is usually a line of people spilling out onto the sidewalk, waiting to be the shop's next customer. Talk about supporting local business, The Bike Guy's shop is about as independent as it gets. The Bike Guy began his love affair with bicycles through mountain bike racing in the late 80s and early 90s. "I got my first mountain bike in 1988 and just fell in love with the sport. It was my great escape." And today mountain bikes are still his passion. He keeps a collection of old mountain bicycles, parts and paraphernalia. The next step for him was a class at The United Bicycle Institute Bike Mechanic School in Oregon. After completing the class, he continued to pursue his passion for bicycles by getting a job the Midvale location of Bingham Cyclery. It only took a few years of working at bicycle shop before The Bike Guy made an important discovery: More often than not, bicycle shops were catering to the avid and experienced cyclist over those less experienced Sunday cruisers. It can be a little scary going into a pro bicycle shop while not being pro yourself. He also often caught himself in a situation, while working at bicycle shops, where he had one idea of how to handle a repair or a situation and wasn't able to follow through because his boss had a different idea. "I'd suggest a $15 tune-up and they just thought that they'd lose their shirts," he explains. The Bike Guy eventually realized that the only way to manifest his ideas about how a bicycle shop should be properly run was to open an independent shop with little overhead cost. So, three years ago, after a little garage remodeling, The Bike Guy and the $15 tune-up were born. "I believe that the bicycle enthusiasts who want to spend thousands of dollars on their sport make up a very small percentage of the general bicycle-riding public. The bike shops compete for those enthusiasts. I want to cater to the other 98 percent of the public that the shops aren't touching." This strategy, paired with his super outgoing and forgiving attitude, has won the hearts of many cyclists around downtown Salt Lake City. Spandex-clad enthusiasts, kids riding to school, parents with children and downhill racers all seek out the Bike Guy for reasons as diverse as their styles of riding. "Once in a while," he says, "a whole group of bike messengers will just show up to help out around the shop and hang out." This family feel at The Bike Guy shop probably explains why his little 4-year-old daughter Vienna seems to know more about bicycles than most adults..
Not only will Barlow tune bikes for his customers, but he is also happy to answer questions that they may have regarding bike maintenance. He also sells refurbished bicycles. These bikes generally cost a little more than a Wal-Mart bike, but are still affordable to those Sunday riders and friendly commuters. With a little extra money, anyone can buy a reasonably priced bike from the Bike Guy that will work better, last longer and still be less expensive than those sold at other bicycle shops. Plus, there will always be a Bike Guy around the corner to keep it running if problems do occur. He also buys bike parts from people including, but definitely not limited to, derailours and anyone who decides to convert their road bike into a fixed gear. This summer, The Bike Guy will be starting a Vintage Bicycle Ride that he hopes to hold every Sunday, beginning at his shop. In the future, he will most likely have to expand out of his garage into an actual commercial space, but he says the same "at home feel" will always be the main attraction. All are welcome at The Bike Guy's shop and this environment has already greatly impacted Salt Lake City's attitude about who's allowed to claim the title of "cyclist." The Bike Guy's shop is open Tuesday-Sunday 8 a.m.-5 p.m. and is located at 1555 South 900 East, Salt Lake City, Utah. And you can find him online at www.thebikeguyslc.com or by phone in his shop at 801.860.1528.